From the Skreddy website: A vintage, 4-transistor distortion, made with meticulous regard to detail. All audio electronics are the same as used circa 1971. Modern upgrades include DC power, LED on/off indicator, and true bypass switching. Yes probably but I'd just left it until someone had built it from this layout. And i'm waiting for a shipment with B100K pots in it. I'm all out of 'em. 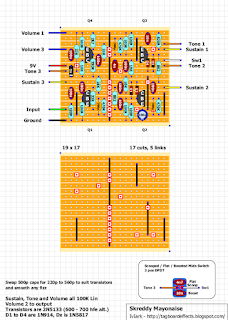 It isn't from scratch because I have so many muff layouts that I use the closest one as a template to work from. I probably did this from the Mayo though. Anyway, i'll be building this once i get the pots. Here we go. I can safely say that this one is verfied. YABMPC with Skreddy quality in the mods. Actually, this may be the first YABMP that doesn't sound like stoner or drone. It's a bit more articulate and not as violent. I just made couple small things to my build. Omitted the switch and used 6n8 cap in the place of 4n. And my choice of transistors this time: MPSA18. Measured four from my batch to be 740 - 760 hfe. That could really be the difference between muddy and clear... Or maybe it's just the fact that all four are measured to be close to each other. HAHA finally! My 5th attempt at building a big muff has worked! It sounds amazing, i've been pretending to be J Mascis all morning. I used BC108c as Q2 and 3, and 2n5088 for the other two. 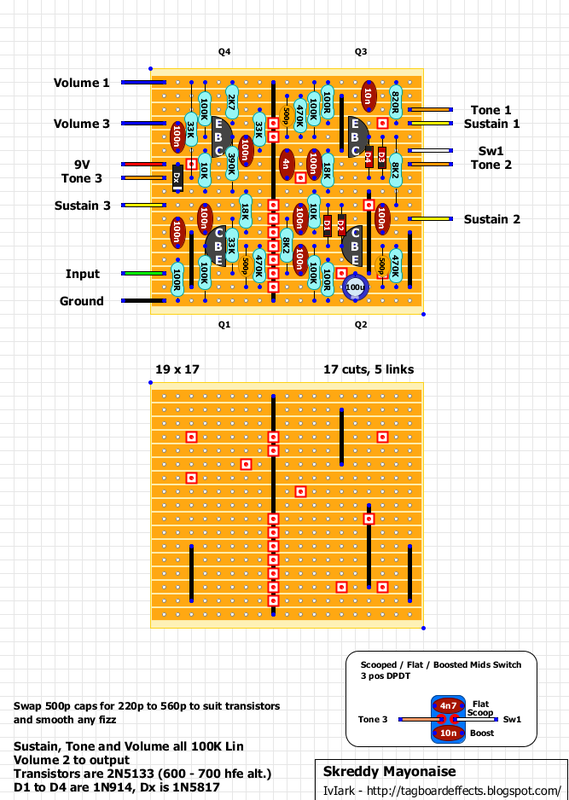 Thanks for the layout, great pedal. Just to clarify. If I want to omit the toggle switch, I just don't out it in? Made it up (with switch)... I ended up using 2n5088's at about 350hfe... I tried 2n5089's first as they measured around 600+ hfe but the gain/sustain in this is so extreme I opted for lesser hfe which doesn't really seem to make that much difference. I used 470pf's too. Seems to have a bit more bite than the standard Muff's... Seems to give off quite a bit of hum too? Shouldn't hum any more or less than any other muff. You could try upping the 100u to 220u or something like that to see if that deals with the noise. If it's still there I suspect a dodgy joint somewhere.